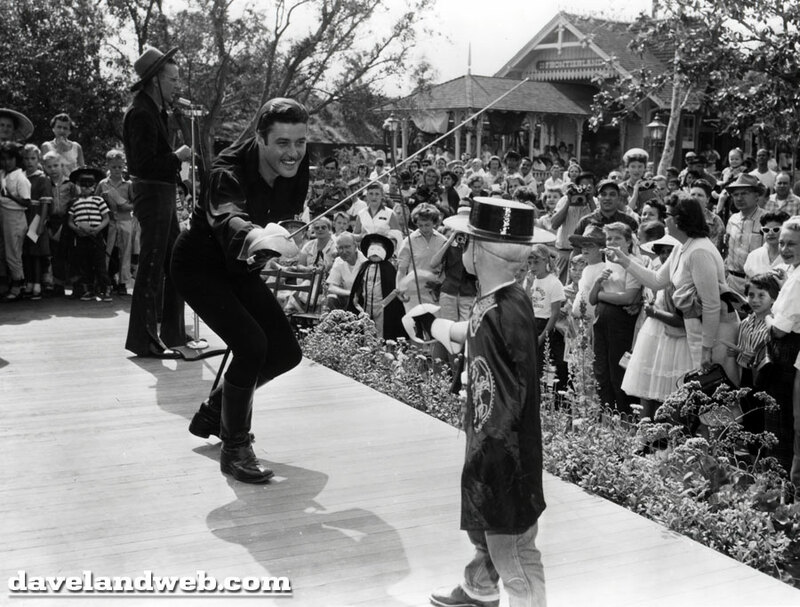 It still blows my mind that Guy Williams, the actor who portrayed Zorro in the runaway hit TV series, actually made his own appearances at Disneyland. I can only imagine what it was like as a kid back in the day to be able to see him do his daring sword fights at the park and then to be able to actually meet him. 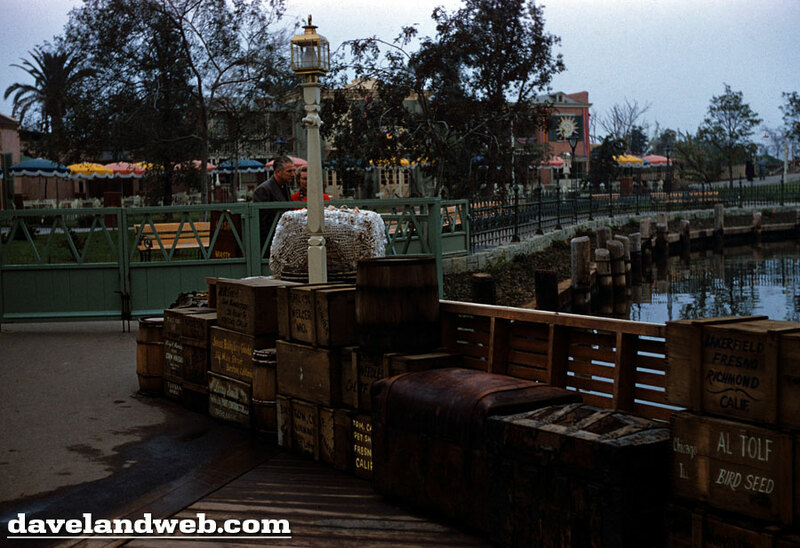 Photo number one has the Frontierland Depot visible to the rear. 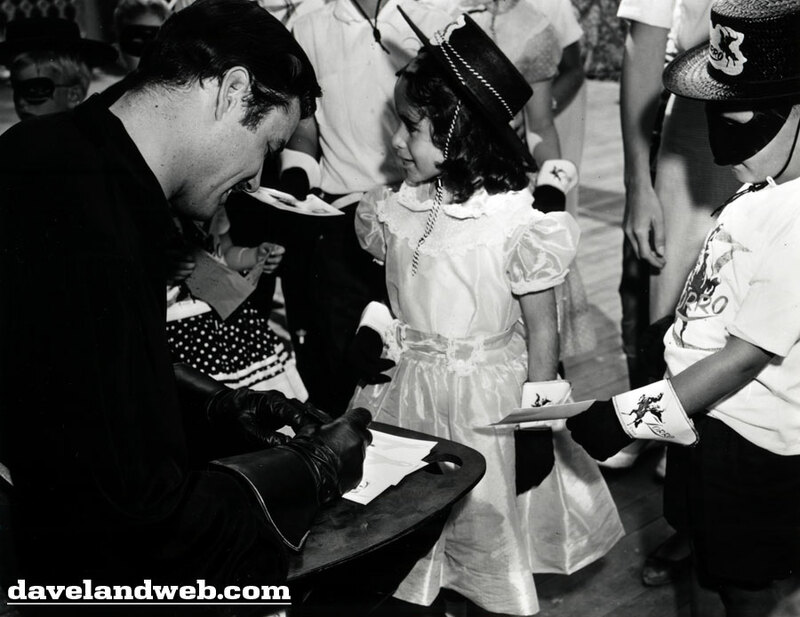 In photo #2, Guy graciously signs the autographs of his young fans. 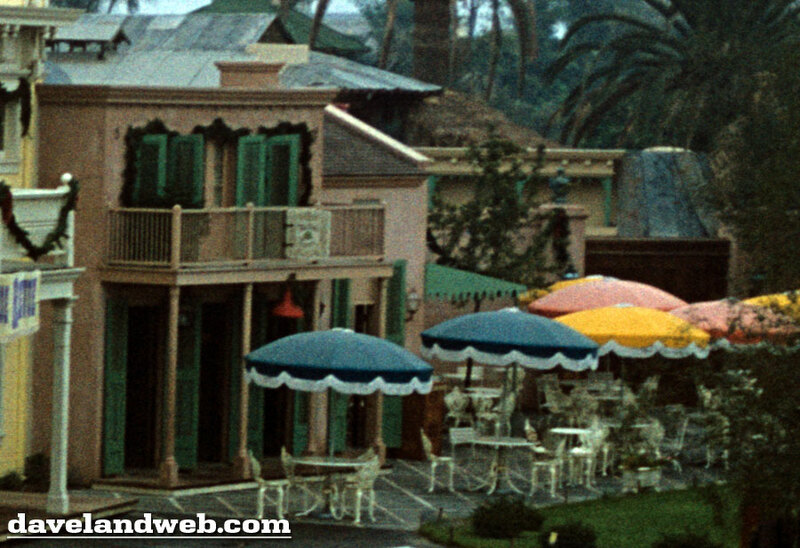 Check out all those souvenir Zorro hats! 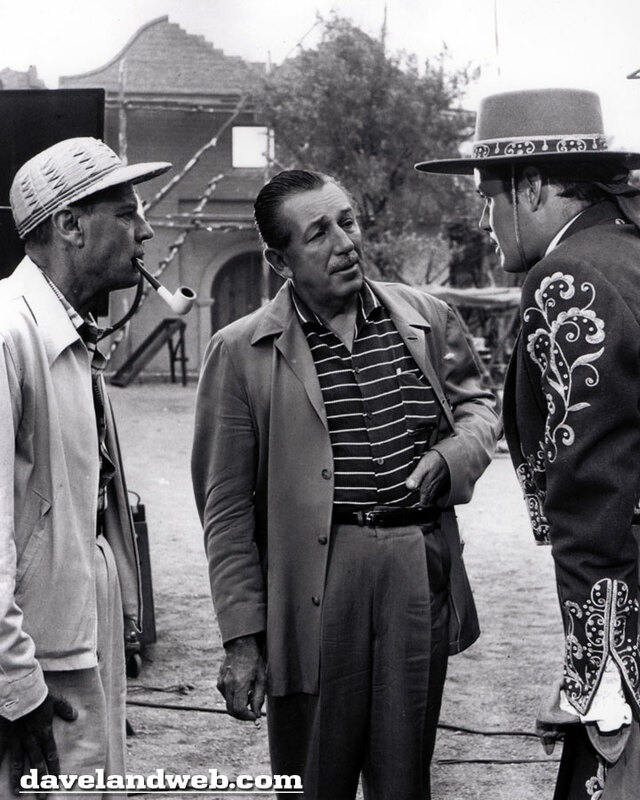 A shot of Walt on the set of Zorro; sure would love to have a transcription of that conversation! See more Zorro photos at my regular website. 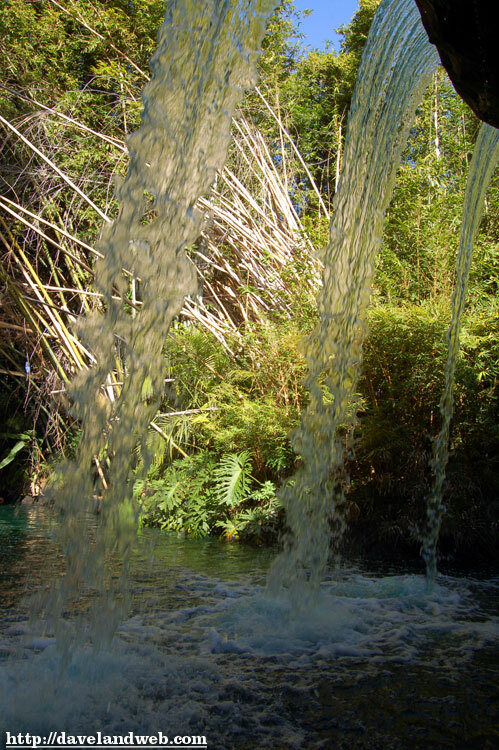 Picture this: a huge man-made mountain visible from the freeway; the world’s first tubular steel roller coast; add in a few waterfalls; what else could you possibly need to make this thing a hit? 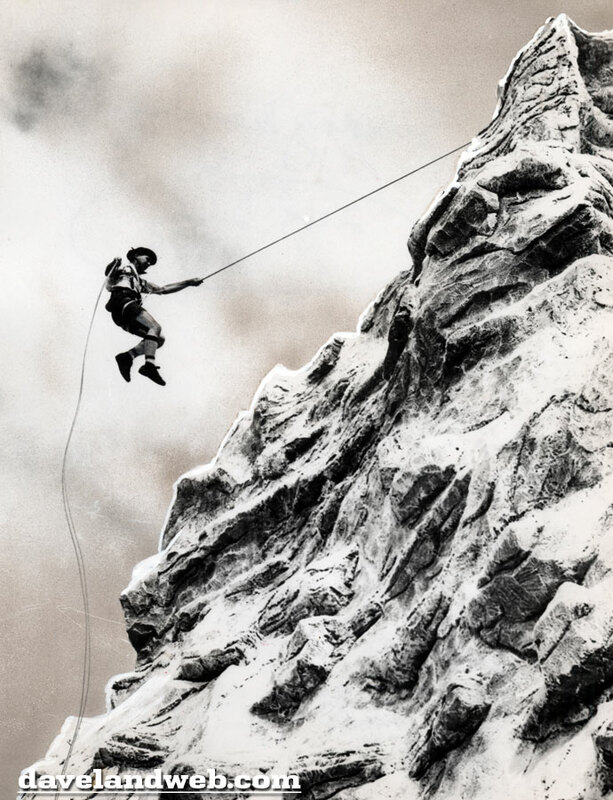 How about some real live mountain climbers?!? 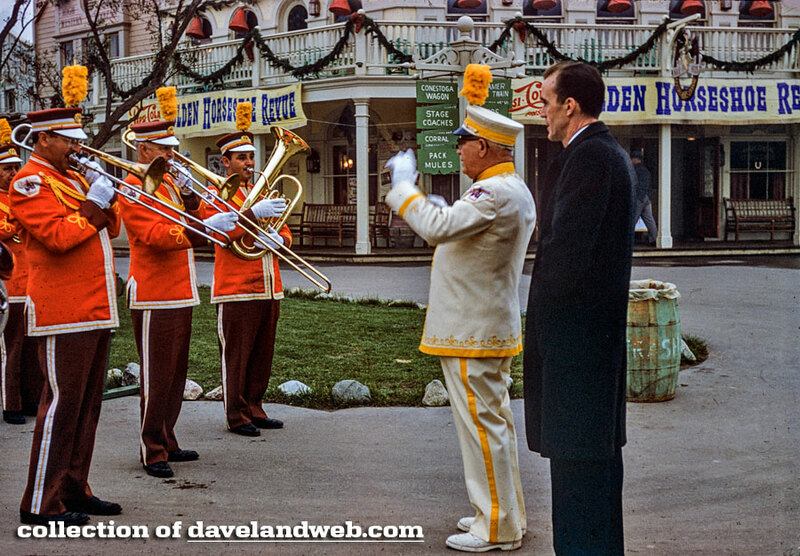 This early May 1959 photo shows one of the young gents testing out the Matterhorn. 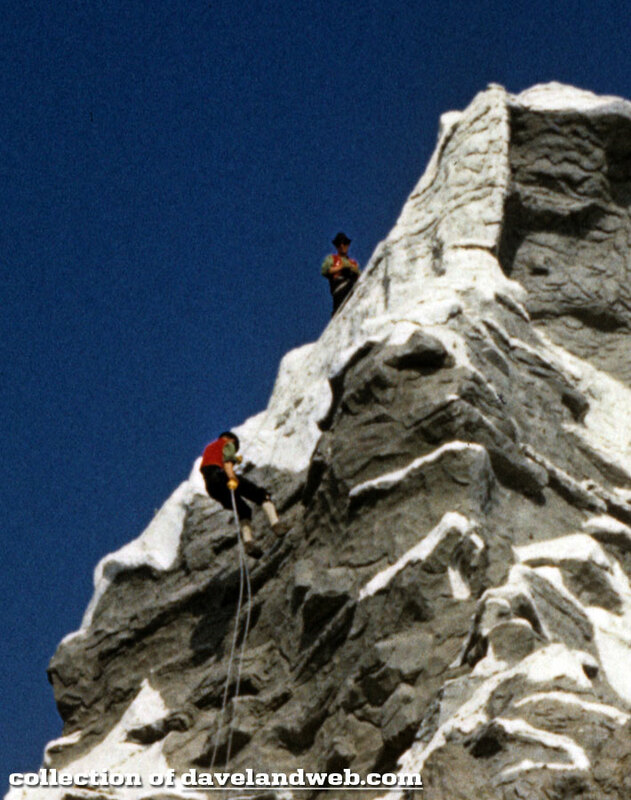 See more Matterhorn photos at my regular website. 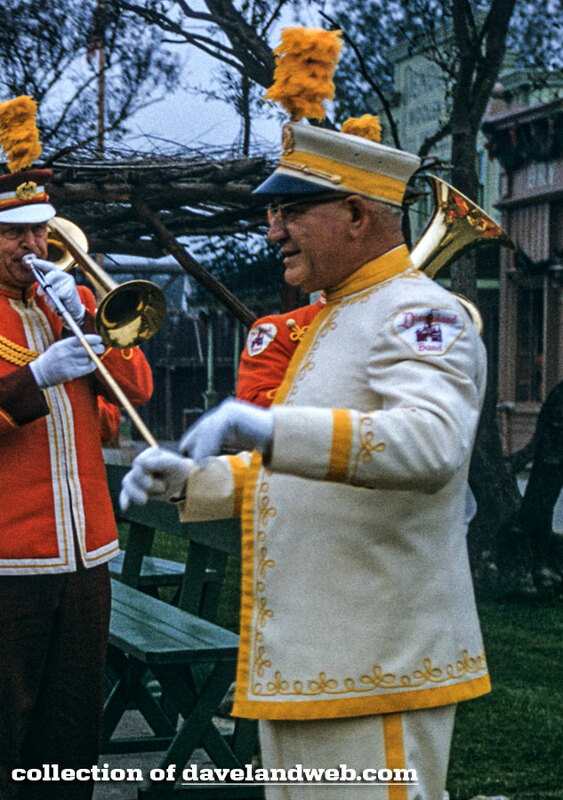 Disneyland Marching Band leader Vesey Walker starts the post off right with a rowsing rendition of (fill in the blank). One of the gents from our group is looking over Vesey's shoulder; perhaps a frustrated band leader who never got his chance? 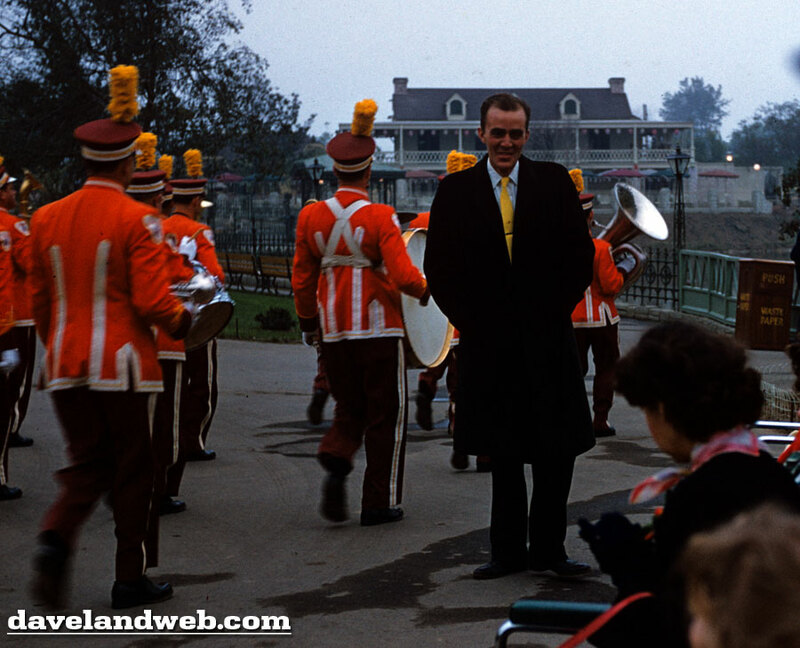 He smiles as the band passes him by (symbolic, perhaps? 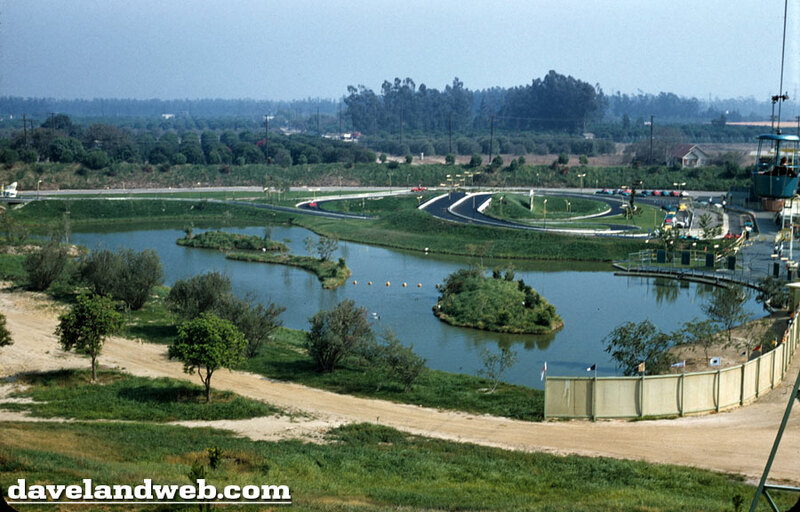 ), with the Chicken Plantation in the background. 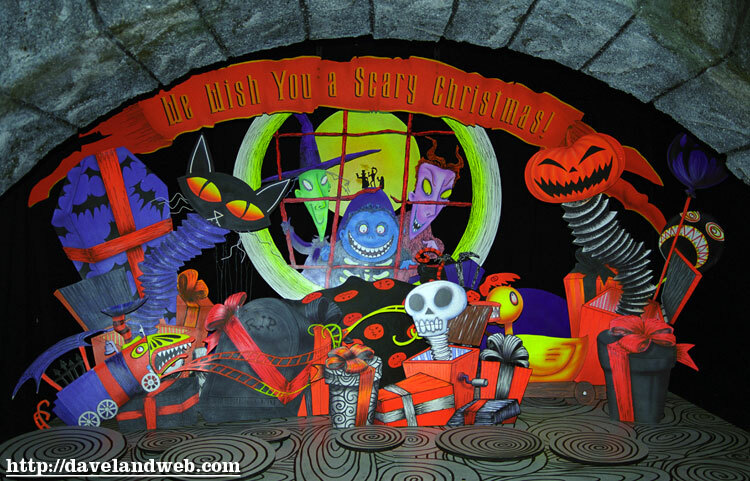 Follow my Daveland updates on Twitter. 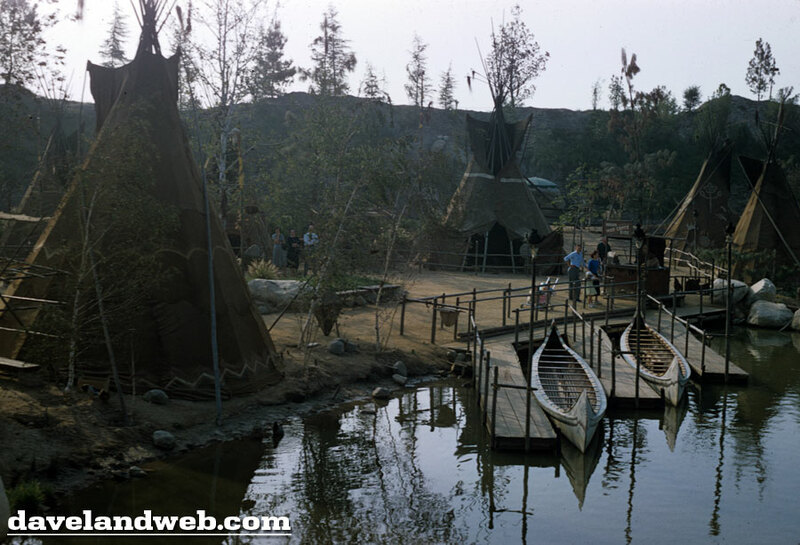 See more Frontierland photos at my regular website. 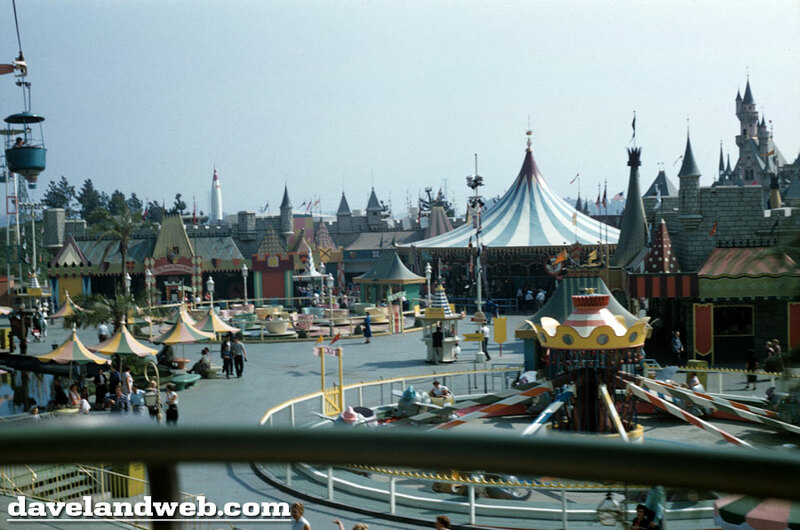 Compare these photos taken a year apart...I think the Imagineers were using different water. What do you think? Follow my updates on Twitter. 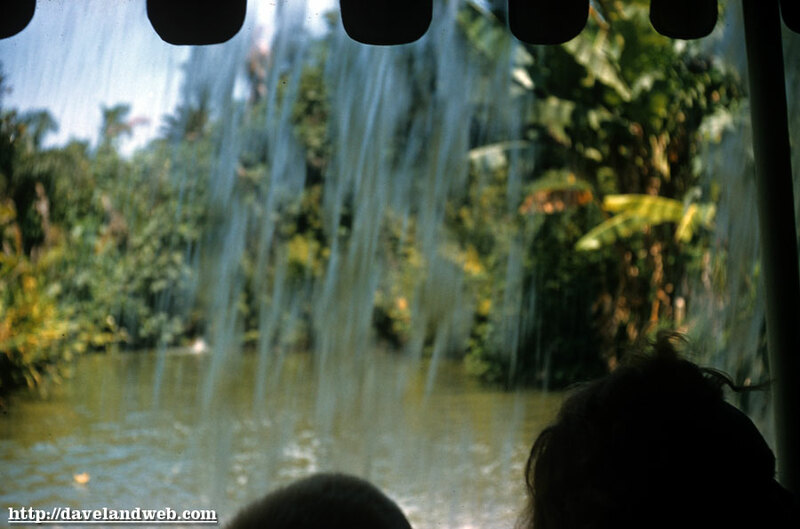 See more vintage (and current) Jungle Cruise photos on my regular website. Alfred Hitchcock directed “Notorious” in 1946, but that title could easily have been applied to Hitchcock’s 1964 mystery, “Marnie.” The previous year, the filmmaker had launched the career of Tippi Hedren, with “The Birds,” and when he cast her again, in “Marnie” (after failing to convince Grace Kelly to temporarily set aside her crown and come out of retirement to take the lead role), Hitchcock was determined to make Hedren a major star—one who would be beholden to him. But, as in the convoluted plots of many of his films, things went awry. Hitchcock’s unnerving fixation on Hedren, about which much has been written, led to an altercation on the set. 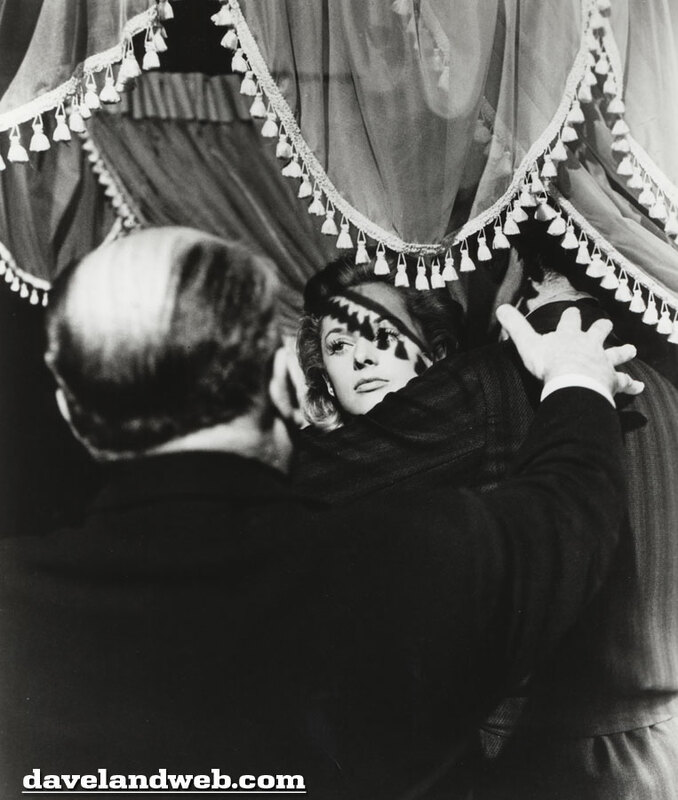 All the director ever said about it was, “She did what no one is permitted to do. She referred to my weight.” In his later years, Hitchcock freely discussed his movies, but he seldom went into much detail about “Marnie”—and he never spoke of Hedren. That “Marnie” deals with a man’s fetishism and a woman’s psychosexual repression makes the film’s relationship to reality all the more creepy, not to mention endlessly fascinating. BOX OFFICE: After the huge success of “Psycho” in 1960, and the strong showing of “The Birds” in 1963, “Marnie” was a disappointment, if not an outright flop. 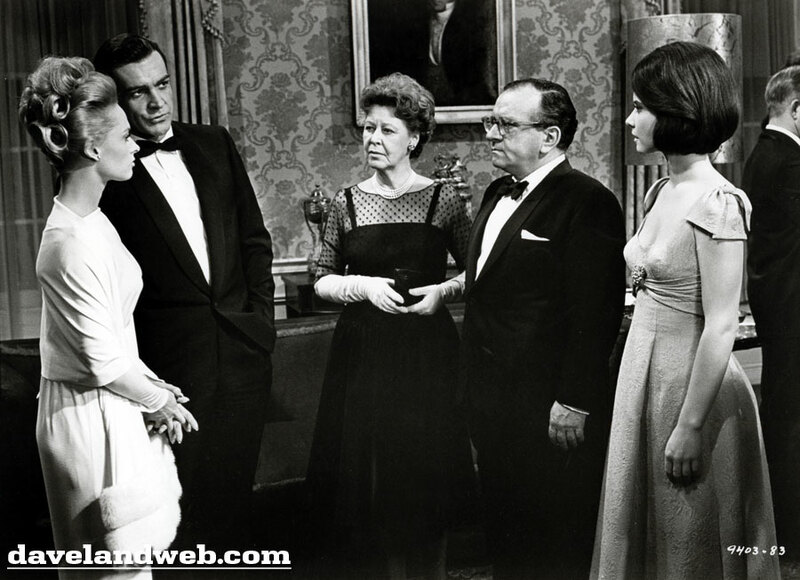 On 1964’s box office list, it landed at number 30 out of 73 films, and it returned only $2.25 million to the studio. WHY IT MATTERS: This “great flawed film” (as François Truffaut later dubbed it) was the lst picture of Hitchcock’s moviemaking prime, an amazingly fertile period that began with “Rope,” in 1948. 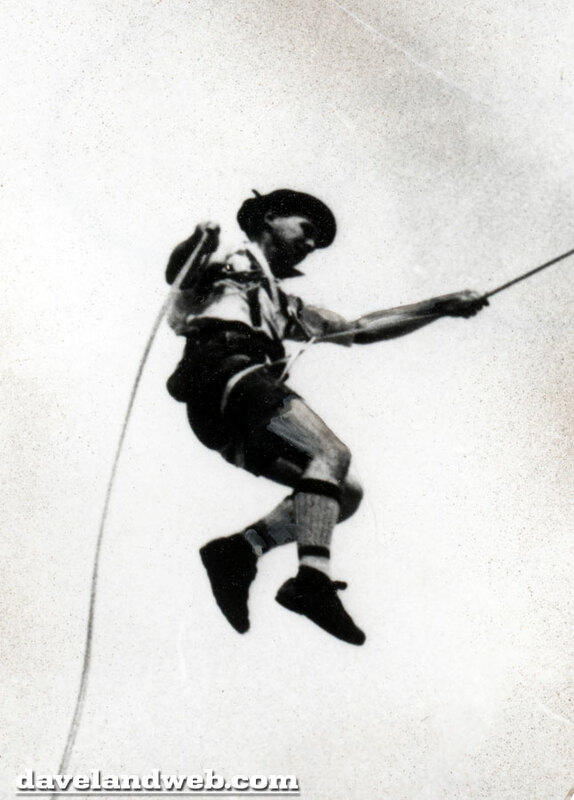 It was the last time he would work with his longtime cinematographer, Robert Burks, and his trusted editor, George Tomasini. It was also the last of his filims to feature the music of the legendary Bernard Herrmann, who would have a falling-out with the director on his next film, “Torn Curtain.” Coming after the visceral shocks of “Pyscho” and “The Birds,” “Marnie” must have befuddled audiences, for it deals almost exclusively with emotional violence; its characters—each tending his or her own particular wound—maneuver themselves like neurotic chess pieces in a game of attration and denial, lust and repression. These characters don’t invite easy empathy, as even screenwriter Jay Presson Allen concedes. “The character of Marnie is a liar and a thief, and there’s nothing sympathetic about her,” she says. 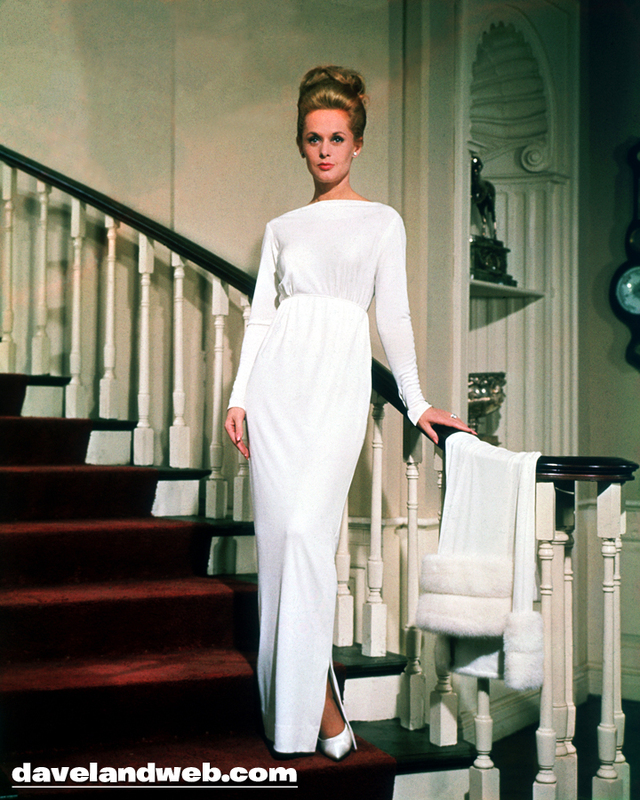 But Hedren does her seemingly impenetrable characer proud, and Sean Connery, playing a man who is unnaturally attracted to a woman he knows is a thief, imbues his vexing role with impressive grace and virility. While some of the technical trickery is strained, certain individual moments—the scene where Marnie washes the black dye out of her hair is one of many—have a power that recalls Hitchcock’s masterpiece “Vertigo.” In some ways “Marnie” is an even more tortured and ambivalent ode on obsession than that great film; definitively unsettling, it grows more so with each viewing. 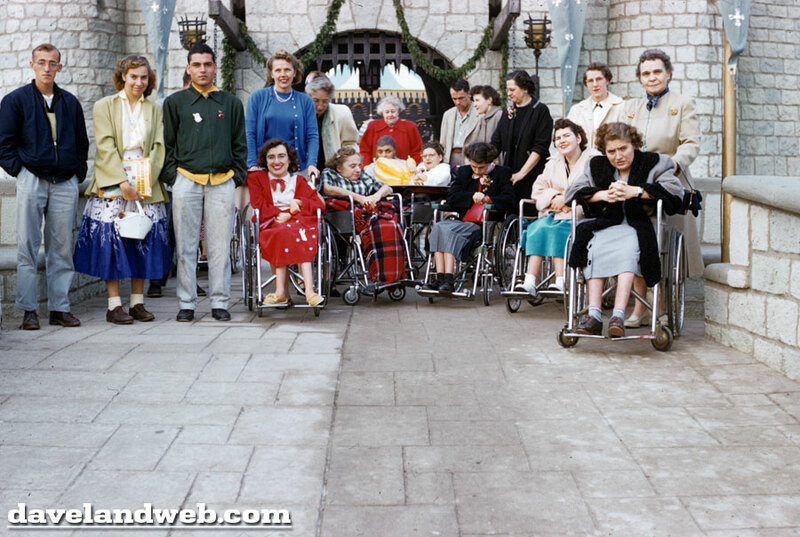 Believe it or not, there is a Disney connection with Marnie. 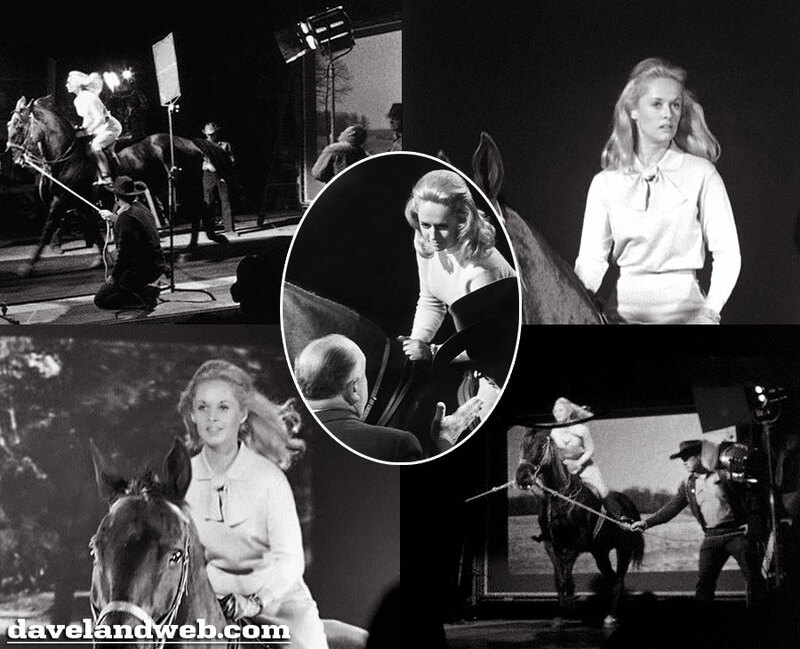 For most of the scenes that show Tippi riding Forio, she is on an actual horse that is on top of a running treadmill, with rear-projection for the background. 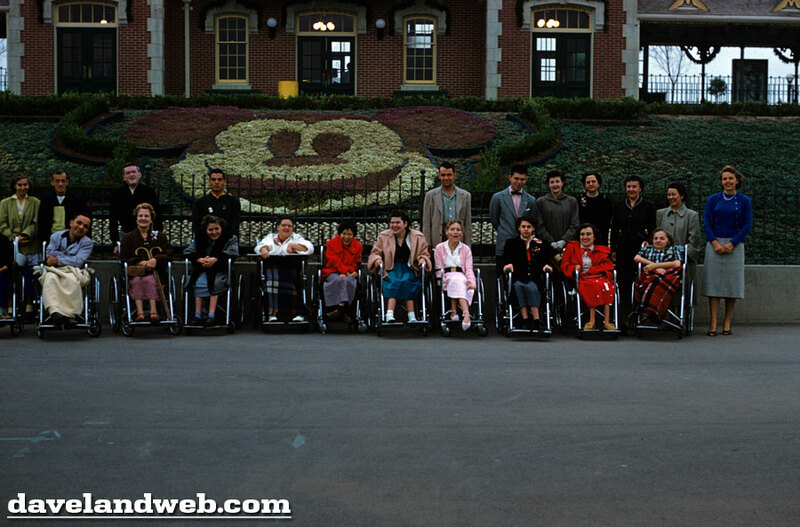 The 30' treadmill was borrowed from MGM. 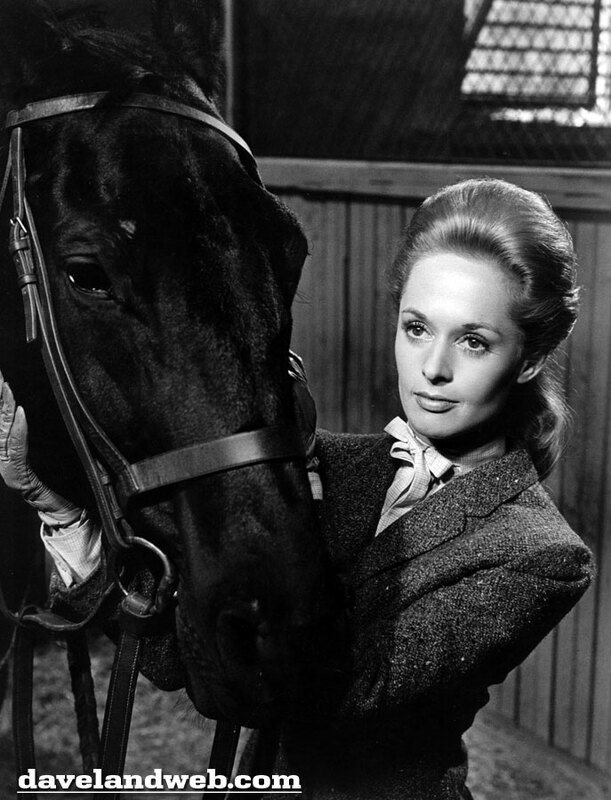 Even though it was extremely dangerous, Hedren did so without wearing any kind of safety harness. 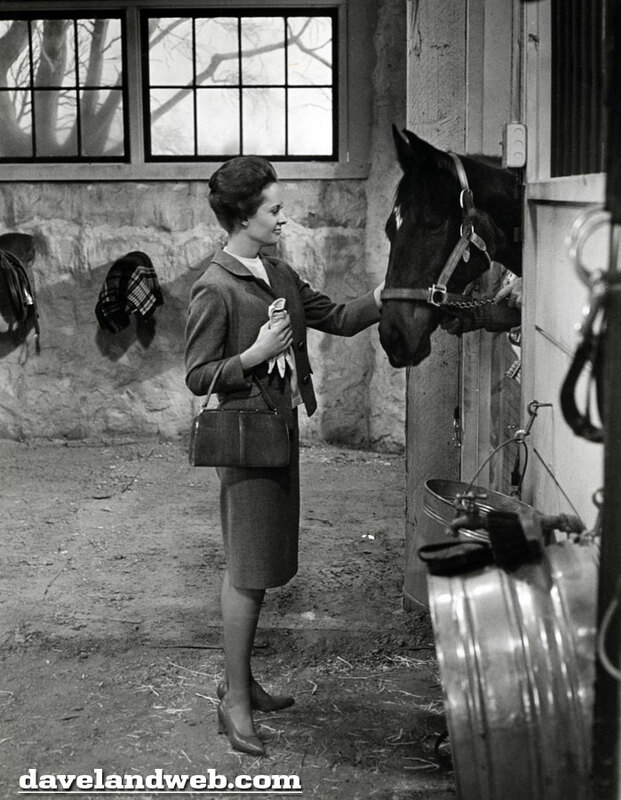 Certain shots, such as the close-ups of Marnie on Forio jumping, could not be achieved with a real horse inside the studio, so Hitchcock asked [Hilton] Green [the unit manager for “Marnie”] to investigate a mechanical horse owned by Walt Disney, which he had heard was very authentic. 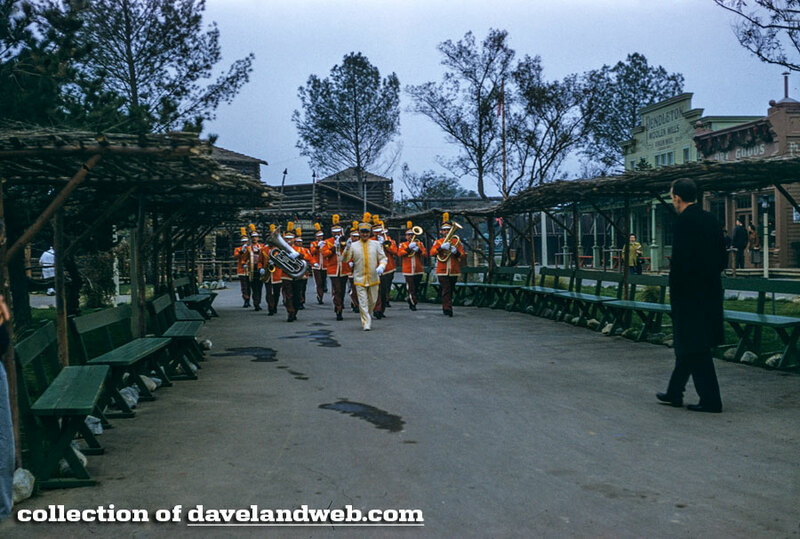 Green met Disney and borrowed the mechanical horse, which was later used for extremely close shots of Hedren and also for [actress Diane] Baker when she is riding in the hunt. To see more Marnie photos, visit my regular website. 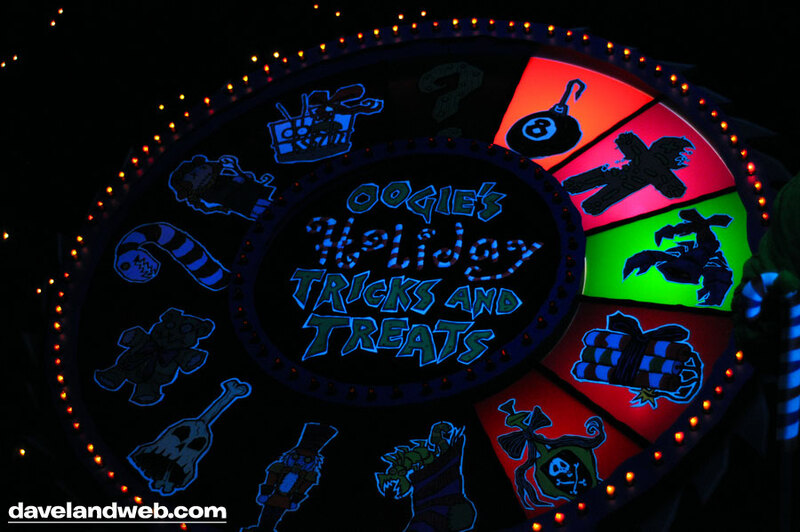 Although it appears to be virtually the same each year, you can see there has been at least one major change when you compare these photos of the Haunted Holiday overlay from January 2003 and December 2005. 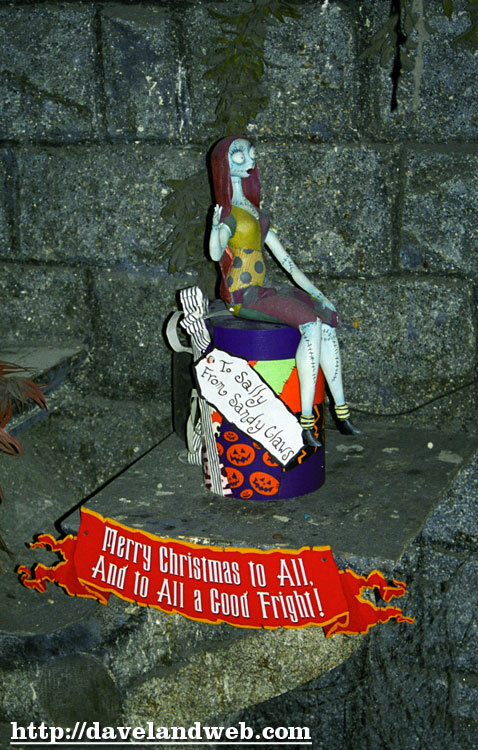 Sally at the end is cool, but surely they could have given her a little motion or something to keep her from seeming like a doll that was just plunked at the end. 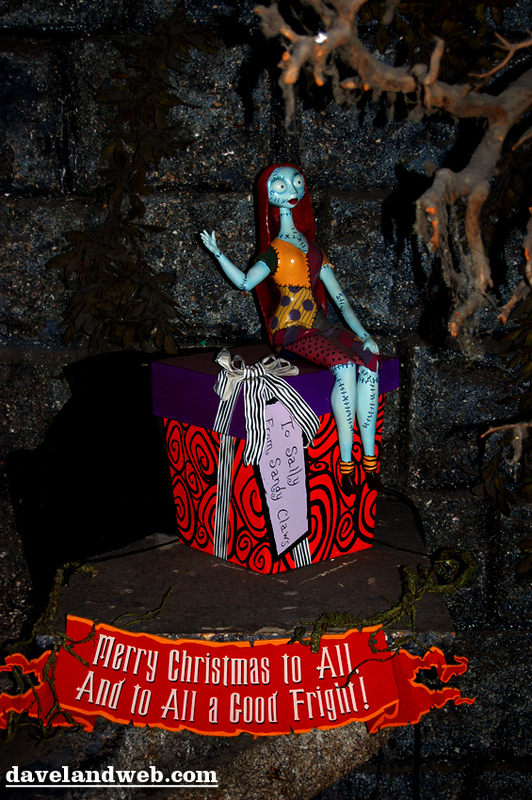 It’s kind of weird with all the other special efffects in the Mansion to just see her sitting static, plopped on a present. Follow my updates on Twitter. 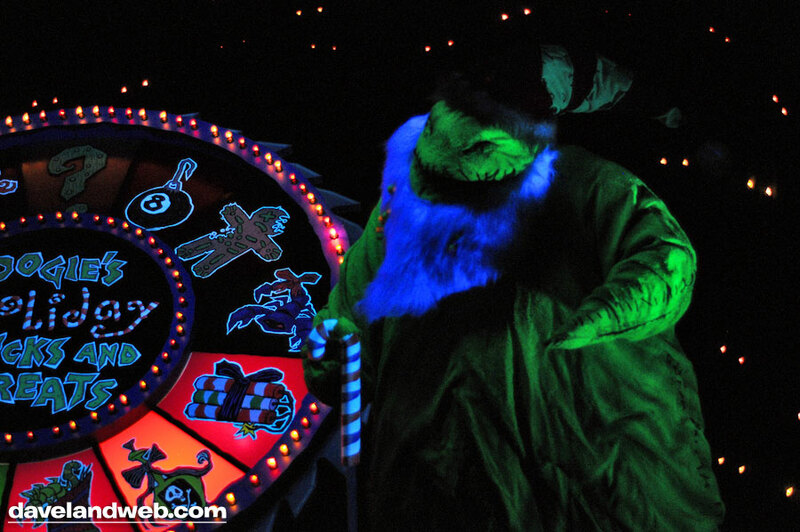 See more Haunted Mansion (regular AND NBC) photos at my website. 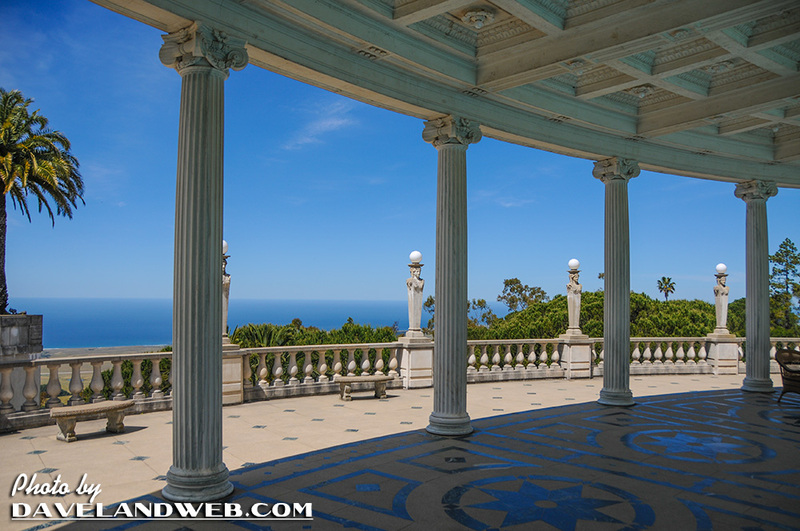 This summer, I was able to check another one off my list: Hearst Castle in San Simeon. Wow...this place was amazing. I cannot wait to go back! 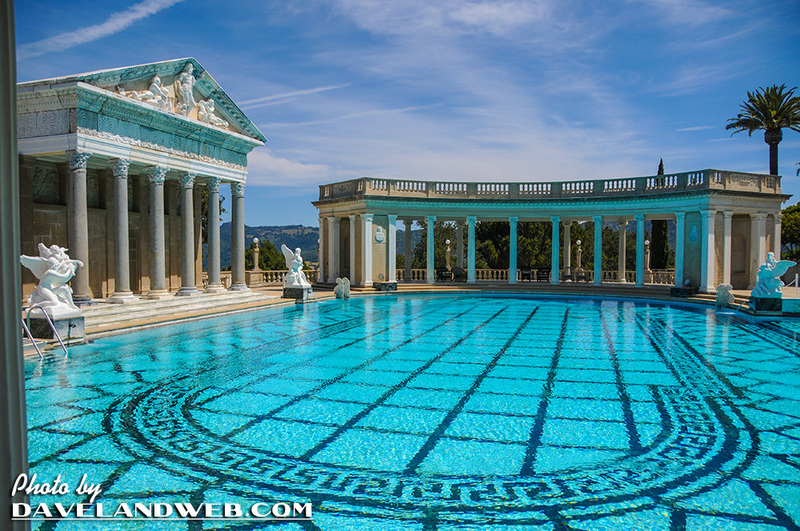 This post focuses on one of the most famous areas at William Randolph Hearst’s estate in San Simeon: The Neptune Pool. 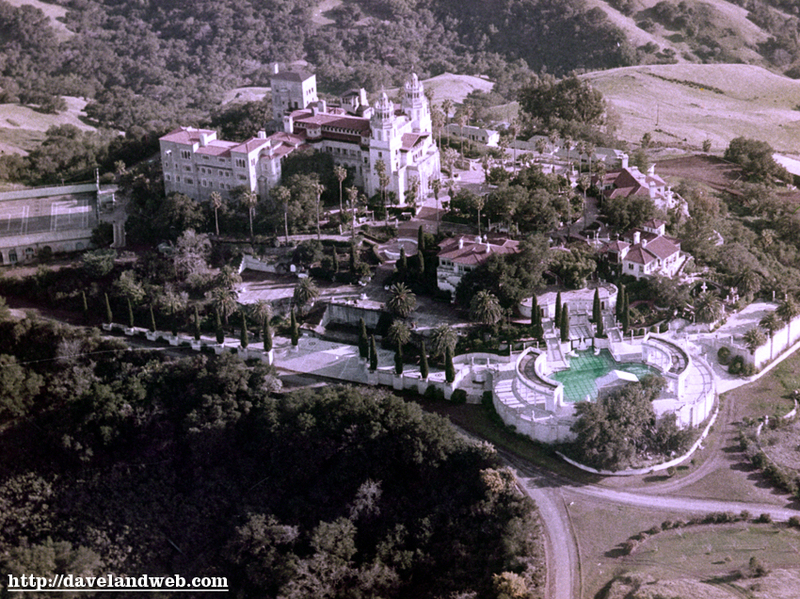 The first photo is a vintage aerial shot to help you get your bearings. The rest of these show how the pool looks today; I am ready to dive right in! 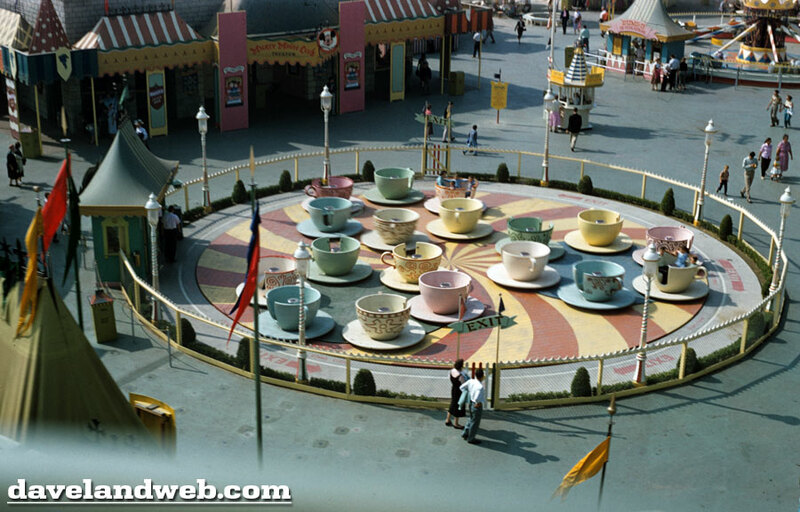 Although it’s not the easiest place to get too, it is well worth the trip. 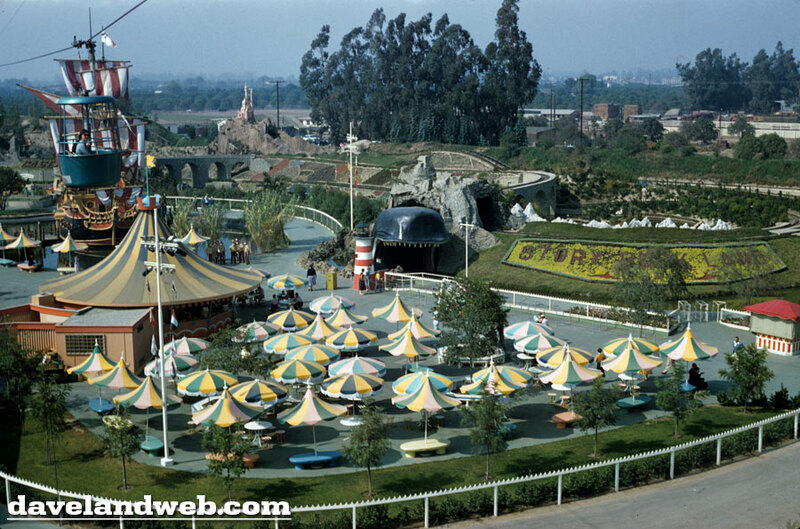 And what a scenic trip, too! 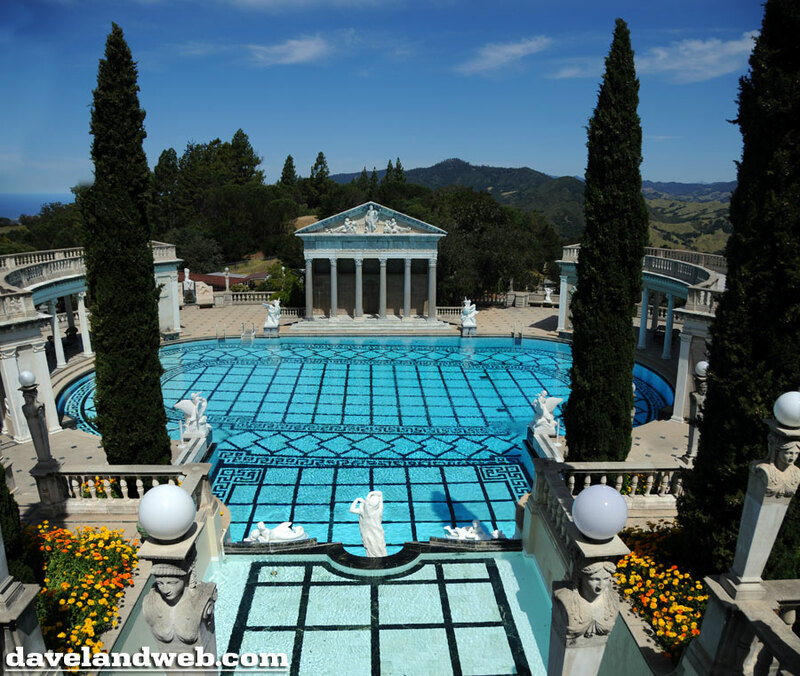 One helpful tip though: if you plan to visit Hearst Castle, definitely book your tours ahead of time as they fill up fast. For more information, visit their website. Follow my updates on Twitter. 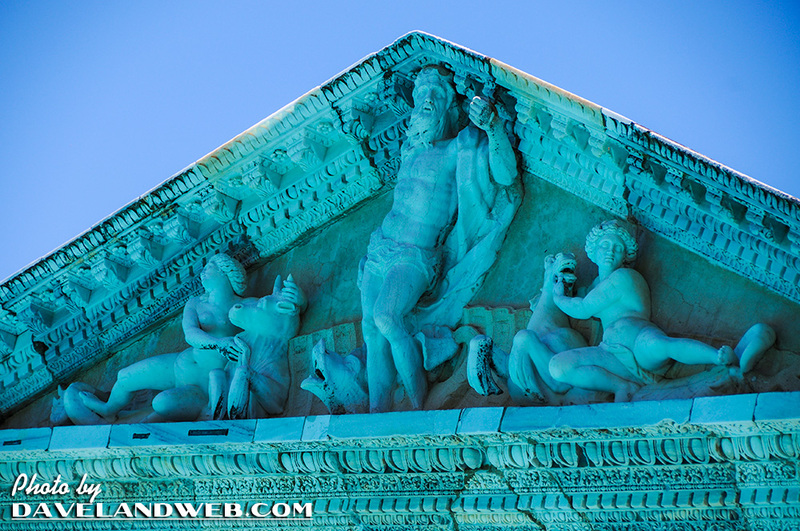 See more San Simeon photos at my regular website. 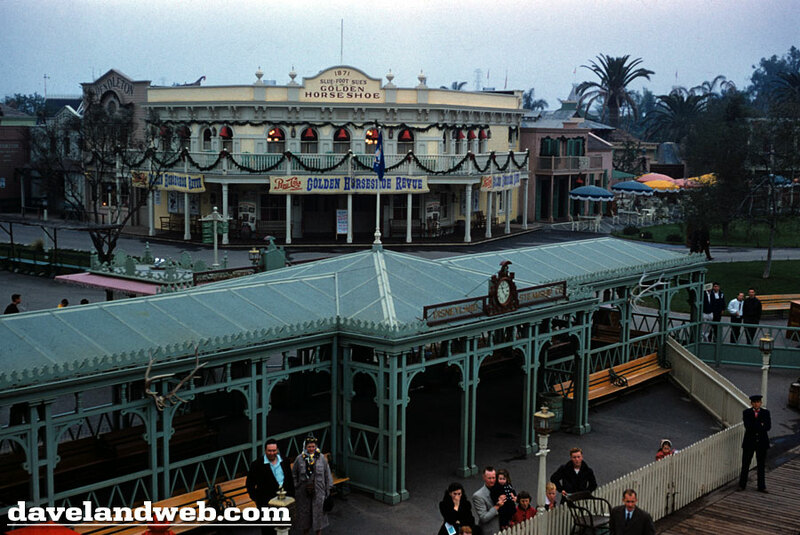 The rest of this series takes place in Frontierland. 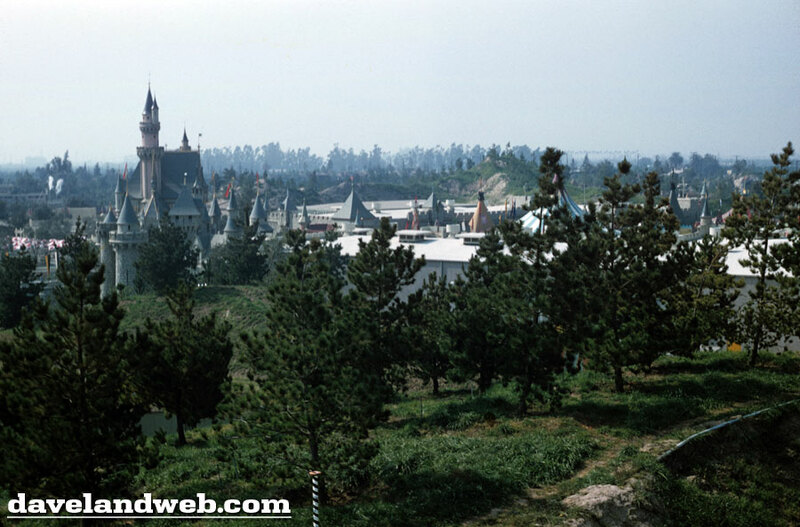 Hope you can stand a few days in the untamed parts of early Disneyland. 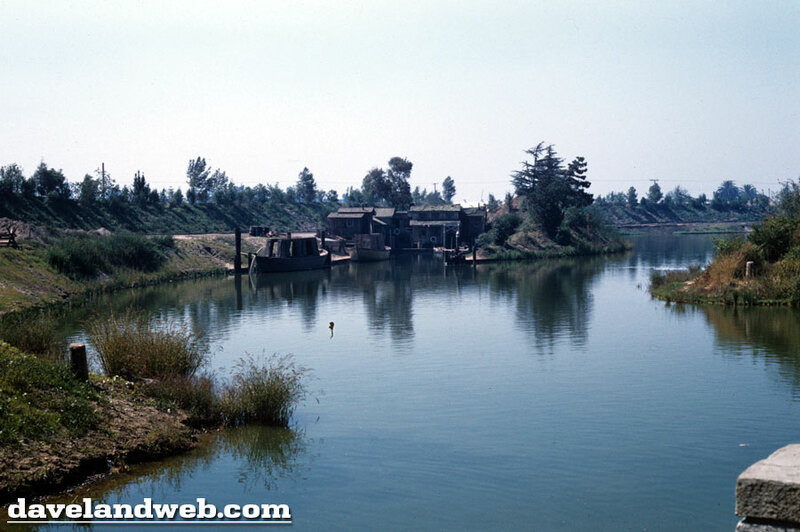 It’s December 1956, and although we have a Keelboat and Fowler’s Harbor, there’s still no Columbia, Haunted Mansion, Fantasmic, OR Critter Country! 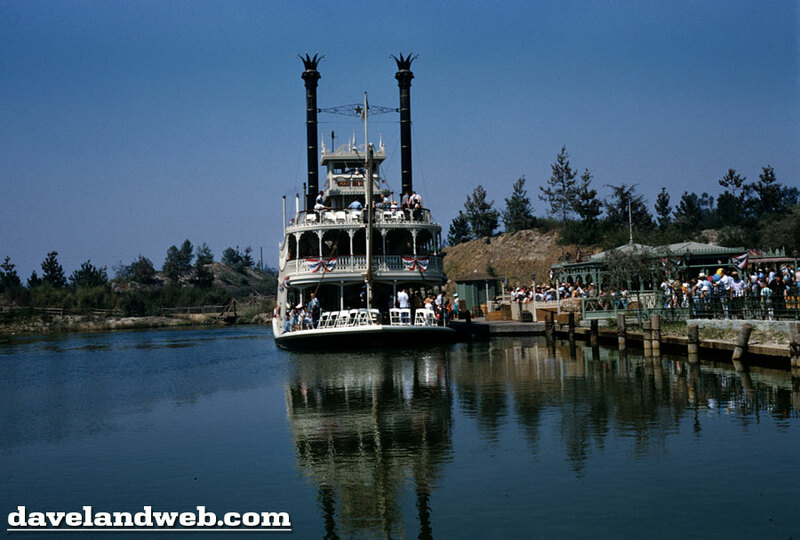 And here’s the mighty Mark Twain in the flesh; it really is a little startling to see so few people, so little landscaping, and even a telephone pole or two! Anybody want a souvenir crate from the dock? 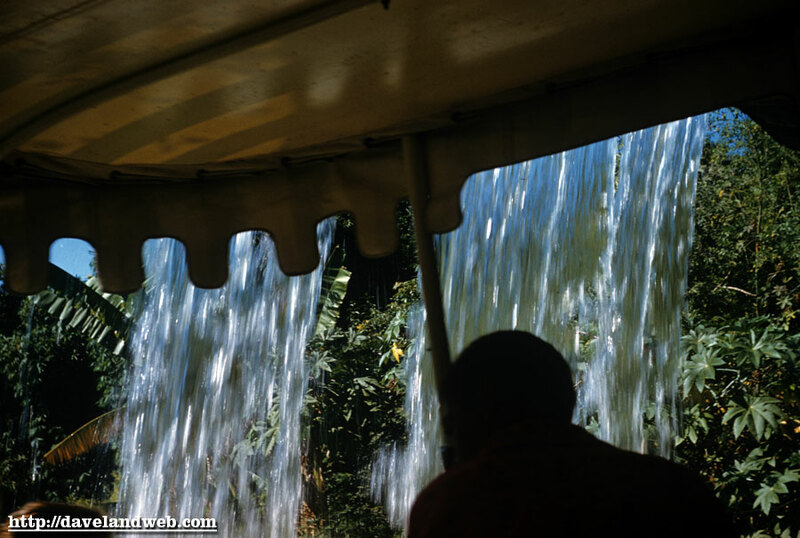 Our 12/56 photographer started snapping pics from his Skyway bucket as he approached Snow Hill, and he just kept on snapping! 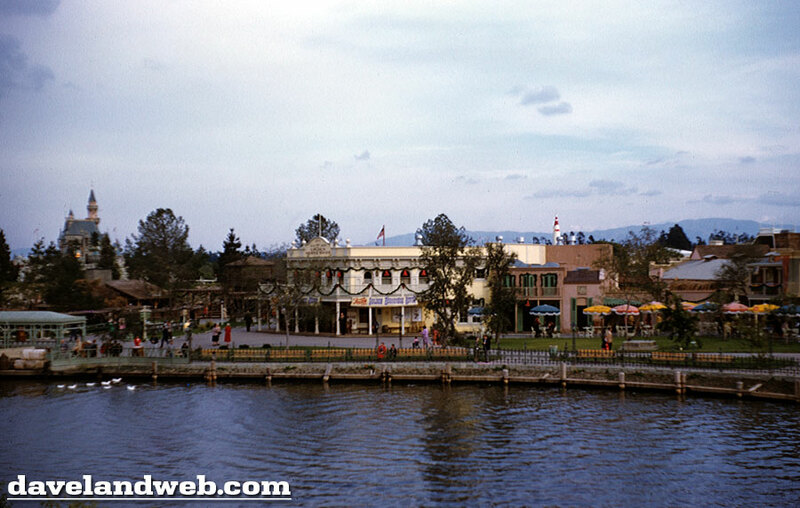 No boats in the Motor Boat Cruise lake today. 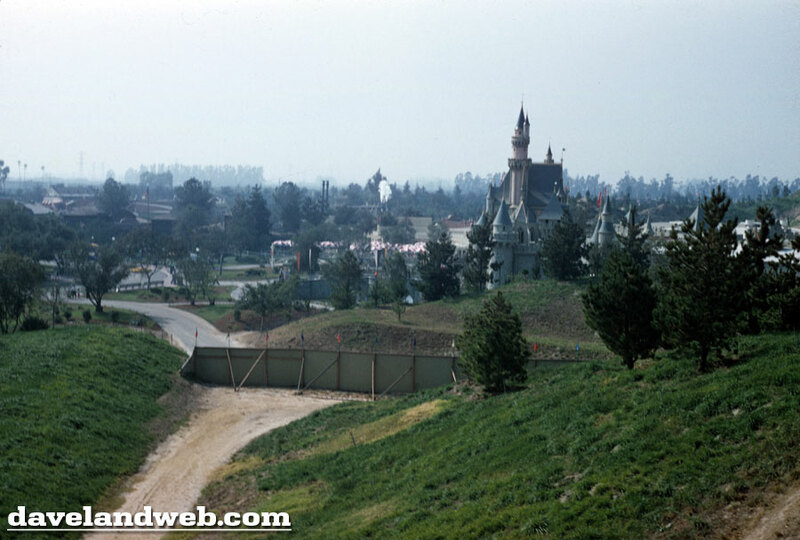 Plenty of room for a Matterhorn or a House of the Future here. 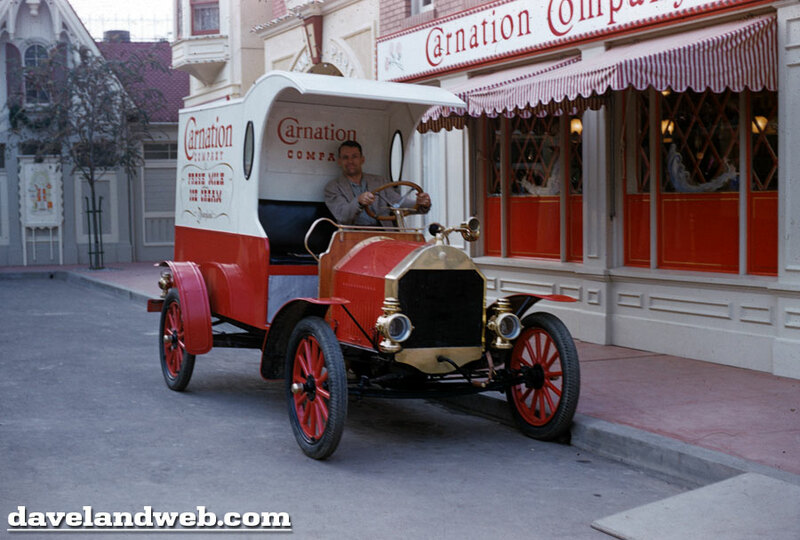 See more Disneyland entrance photos at my regular website. 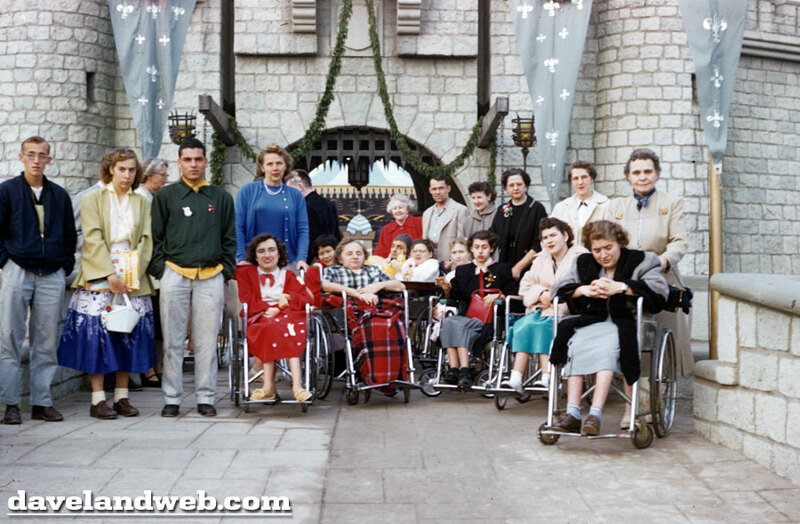 I don’t know too much about the background of this batch from December 1956; it appears to be a group of handicapped people in wheelchairs were getting a special day at the park. 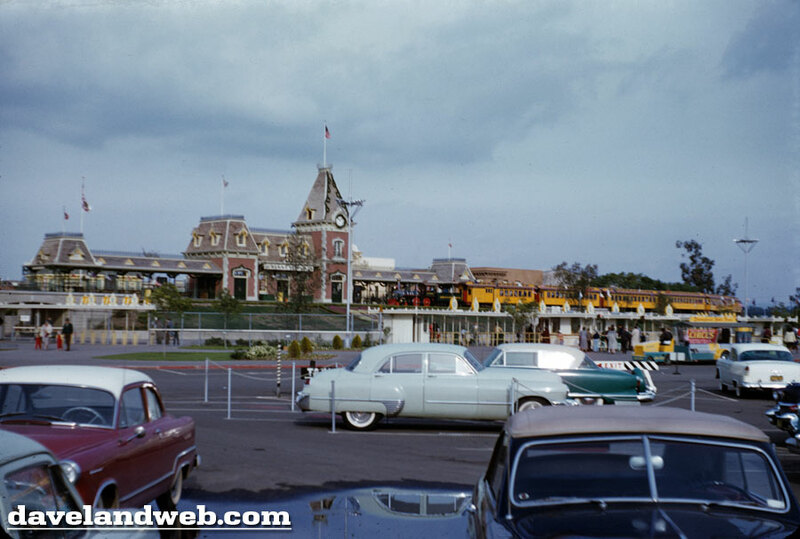 Other than that, what else is there to know besides the fact that the photographer got some great views of early Disneyland! 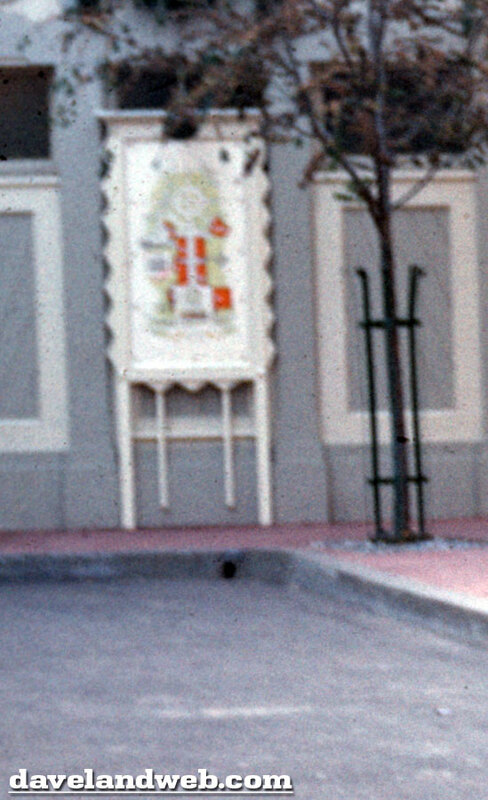 One additional note here; although these slides came together in a batch, I am not sure that they are all necessarily related or even taken at the same time. 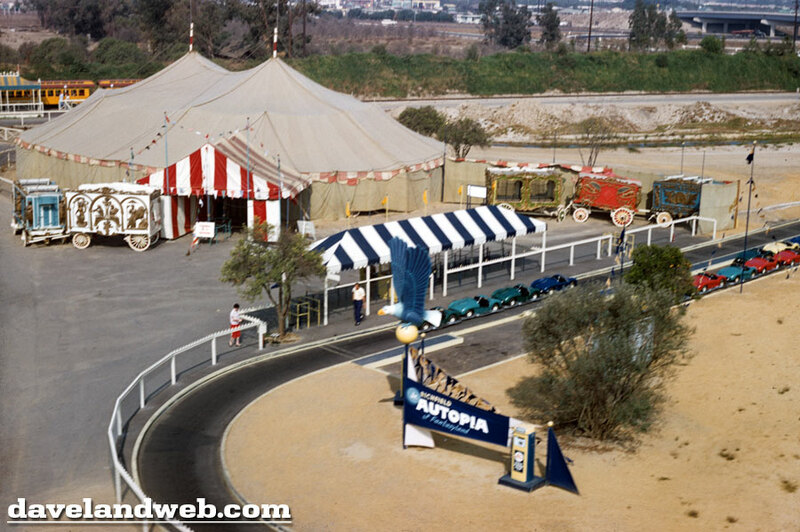 There are a few possible inconsistencies (such as the Circus signage and tent still visible in December of 1956), but hey...just deal, as I am going to present them all together anyway. 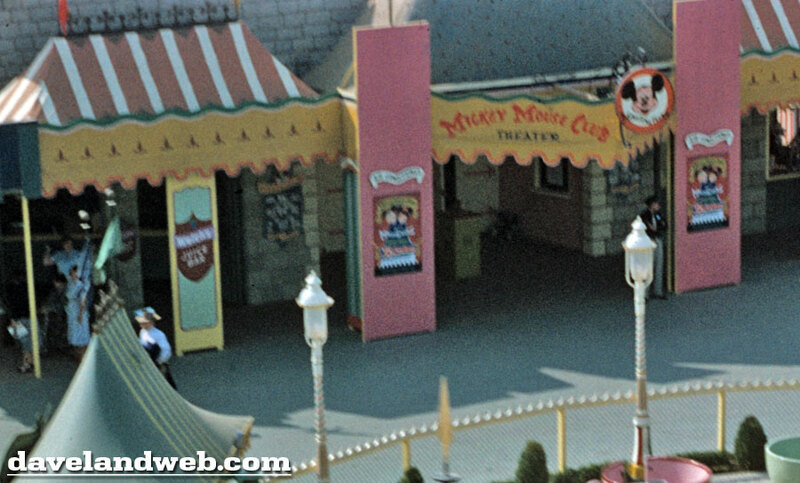 In the first parking lot shot, you can see some signage on the right advertising (what’s left of?) 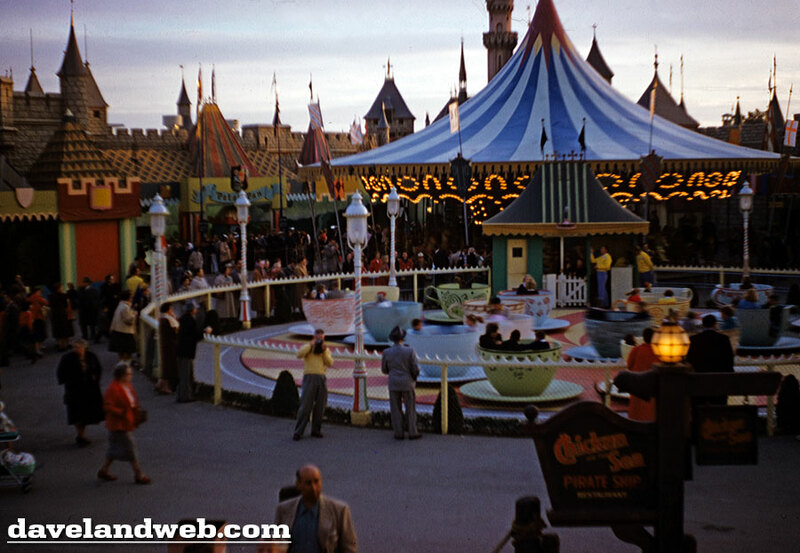 the Disneyland Circus. No Flower Market yet here on West Center Street. 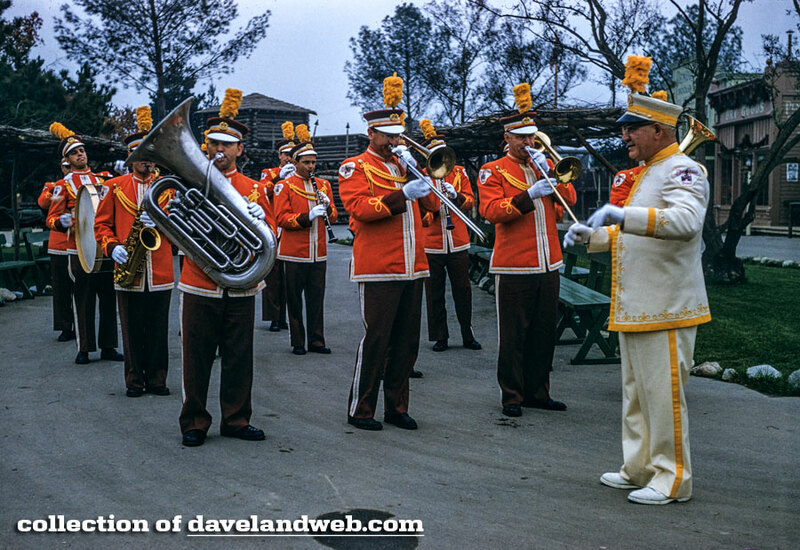 Follow my Daveland updates on Twitter. 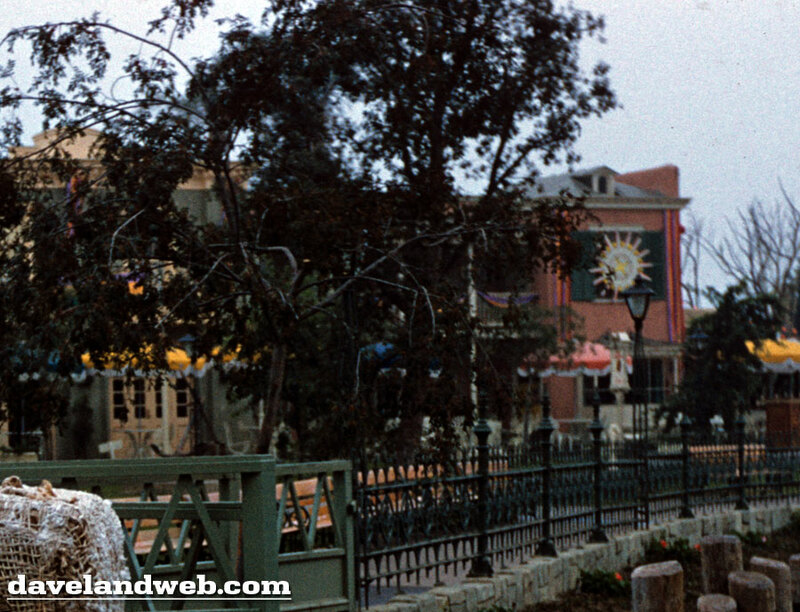 See more Disneyland entrance photos at my regular website. 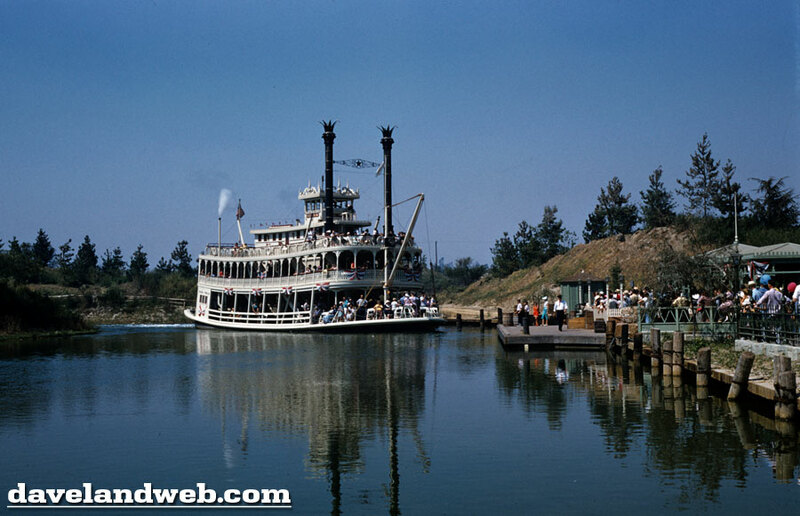 Happy 54th Anniversary, Tom Sawyer Island!